Progress is being made on my latest robot project. 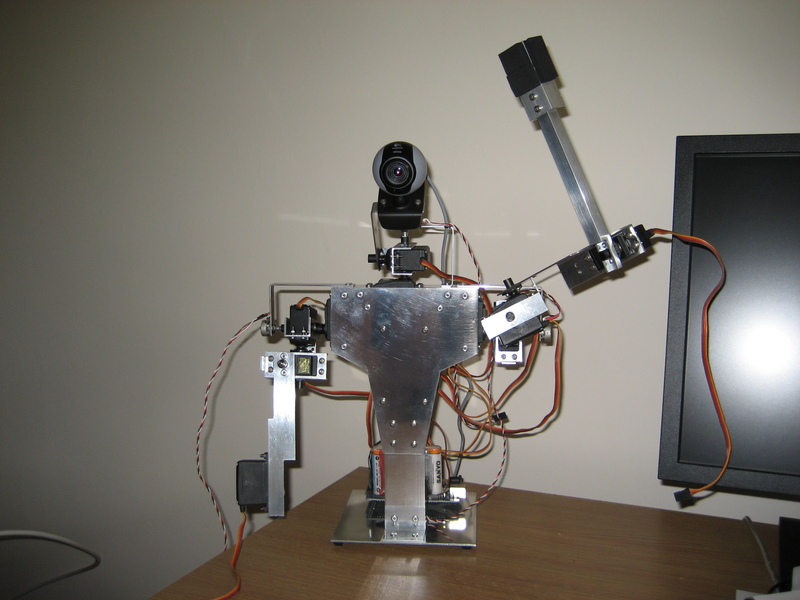 My humanoid robot now has a head, or an eye at least. I bought a new webcam purely for aesthetic reasons as the rounded shape makes it look like my robot has a head of sorts. I was hoping to have the second arm completed by now but I had to remake the webcam bracket after the first one was slightly too short. I’ve also machined a new lower arm section for the arm that has been built to make it a bit longer. I’ve started the second arm with the upper arm section complete and the elbow servo fitted. I’ve also managed to get two potentiometer mounting brackets made and fitted which means I’ve been able to test a couple of the servos. So far so good, the only issue I’ve had is that the servos I’m using for the first shoulder joint are different to the rest. They needed more torque than the others as they are lifting the weight of the whole arm. The issue is that they don’t rotate as far as the rest of the servos, around 130 degrees of rotation compared to 180. Not a massive problem but I’ve had to sacrifice some backwards movement of the arm to allow the full forward motion I desire. Anyway, check out the picture below to see where I’m at and give a little wave to my new robot!